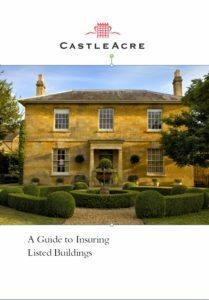 Castleacre specialise in arranging listed building insurance for historic buildings within the United Kingdom, Ireland and Europe. There are over 370,000 buildings which are listed in England alone and the vast majority of these and other listed and historic buildings in the United Kingdom, Ireland and Europe are in private hands. Anyone who lives in a listed, historic building or protected structure usually regards ownership with a mixture of servitude and pride – these buildings are protected by law because they are of national importance and are often architecturally outstanding, historically significant or within an area of special conservation. There is no doubt that owning a protected, listed or historic property is a tremendous privilege but it also imposes additional reponsibilities on owners. In 2007 a leading heritage insurer found that 55% of listed buildings were underinsured, which is why we take the time and trouble to appraise each listed property we are asked to insure with care and consideration. If the worst does happen it is very reassuring to know that your cover has been carefully tailored to your property and that you will receive the compensation you need to reinstate your home. What can we offer the owners of Listed Buildings and Protected Structures? Accurate Building Valutions and Surveys We work with specialist surveyors to accurately identify the re-build costs of a listed building so that if owners do need to make a claim they know that they will receive the right compensation and will neither be under or over insured. Replacement sums insured must take into account the extra cost of having to re-build in identical materials and the necessity of employing specialist builders and crafts people to reinstate a listed building. Archaelogical costs We can arrange cover which will take into account the possibility of archaelogical surveys either as a result of authorised renovations or extensions or because of an insured event. Cover for a Listed Property undergoing Renovation Authorised Renovation, repair or extension of a listed property can make it more vulnerable to risk and owners can sometimes find it difficult or expensive to arrange adequate cover. We can help tailor cover during building works even if your property is temporarily unoccupied.